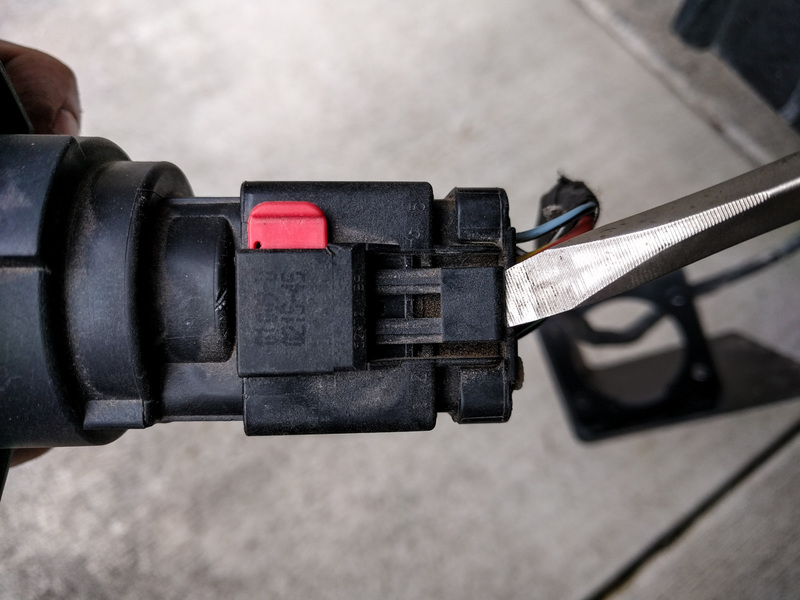 Good luck trying to find a locking trailer hitch pin that will fit in the tiny space that Mercedes leaves at the side of the 2″ receiver mount. Receiver hitches aren’t common in Europe, so maybe the German engineers got a little confused about how they are typically used. 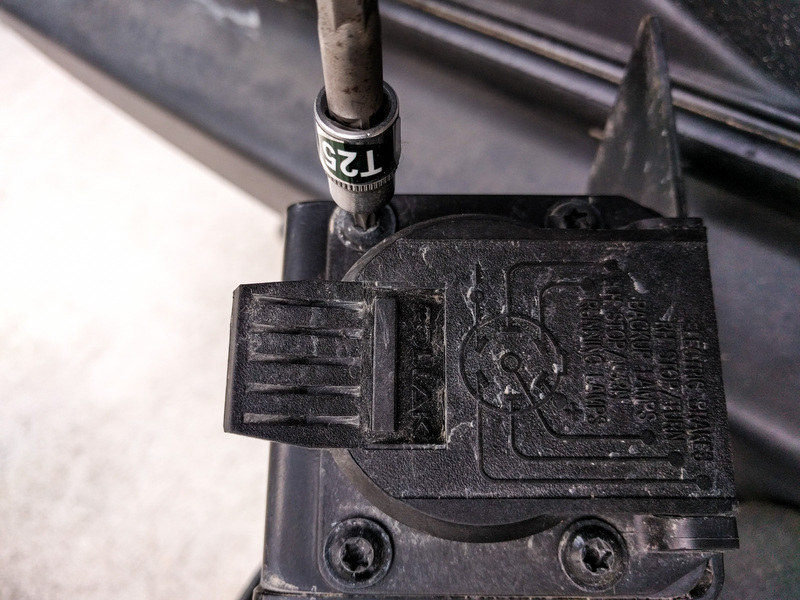 When we added a hitch mounted step to our van, it was hard to find a locking pin that would work. 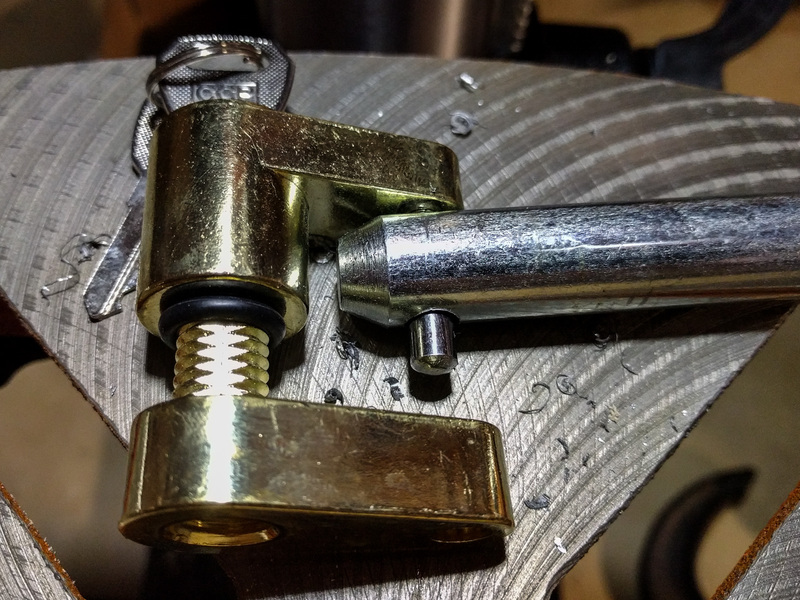 We ended up making a 90 degree pin lock but ever since then we’ve contemplated just moving the electrical connector for the hitch. Problem is, it’s not easy to know where to put it. 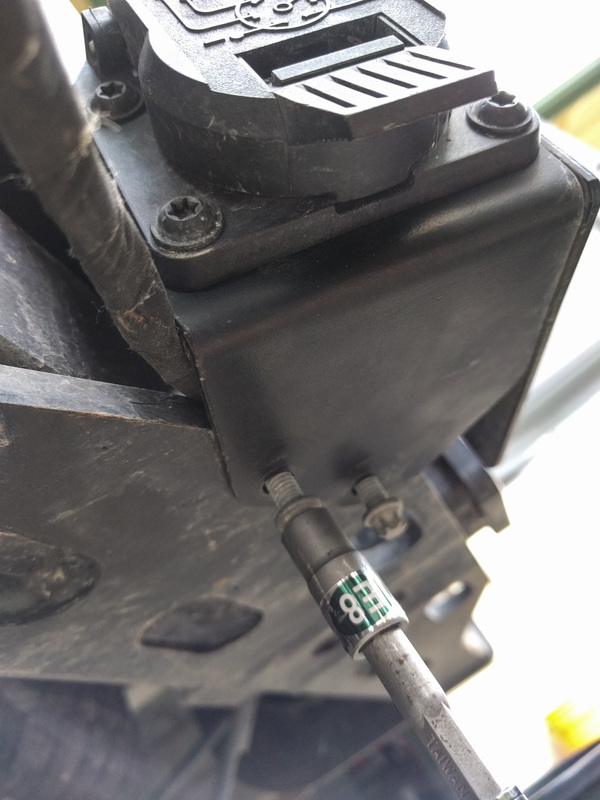 Here’s how the electrical box looks attached to the factory hitch. Our hitch mounted step clears it (just), but it’s less than ideal. Notice how little room there is to the left of the receiver. Most locking hitch pins have keys that insert from the end. That’s just not possible with this setup. 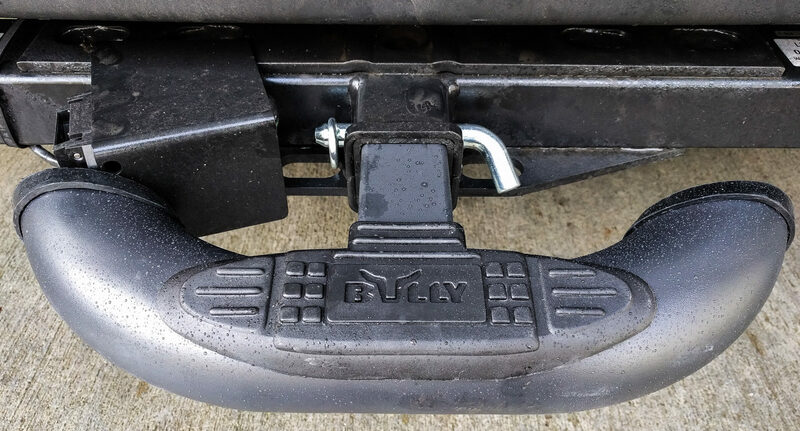 Bully Black Bull bar mounted to stock Sprinter hitch with a regular hitch pin. Want to lock it? How would you get the key in there? You can buy 90 degree pins, but the Amazon reviews suggest they’re not a long-term item. They seem to rust and seize up a lot. We made our own using a Curt 21580 hitch pin and a Reese Towpower 7006600 coupler lock. The lock is cheap and nasty at under $5, but it should do the trick. We drilled out the pin and added a lock that attaches from the side rather than from the end. We doused the lock in grease to try and stave off the seizing issue. So, we have a solution, but it is far from ideal. How about relocating that electrical box? We initially thought the box was welded in place. But it is actually just bolted on from underneath. Removing the two E8 (inverse Torx) bolts frees it from the hitch. The trailer wiring box is removable. Two E8 bolts underneath. With the metal housing removed, we looked for alternative connection points. The only one we could find is on the left hand end of the hitch. It would probably require fabricating a new bracket, and we really didn’t want to drill and tap the structural parts of the hitch (although it’s probably just fine – pretty darn sturdy). 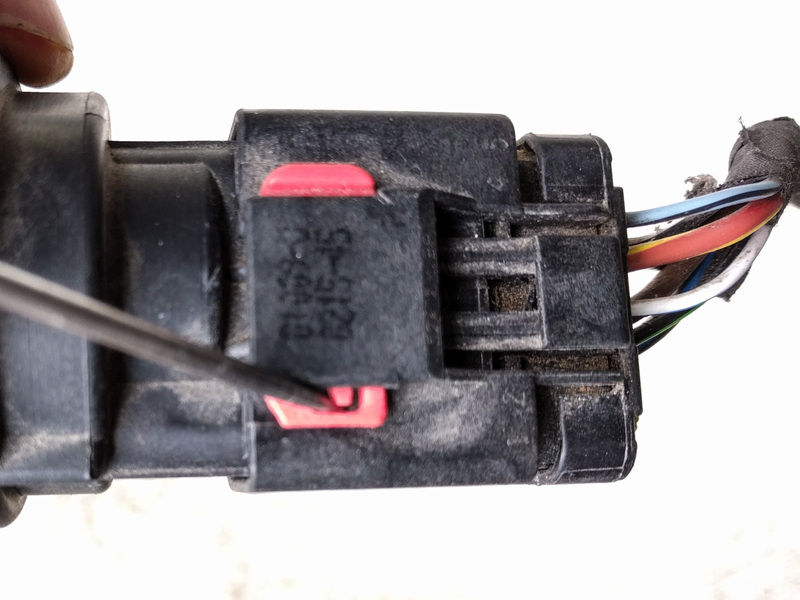 This would mean that the trailer wiring gets stretched a lot when you make a hard right turn. Not ideal. We ended up just re-connecting everything and putting it back in the original location. OK, maybe that is the best location, sort of. 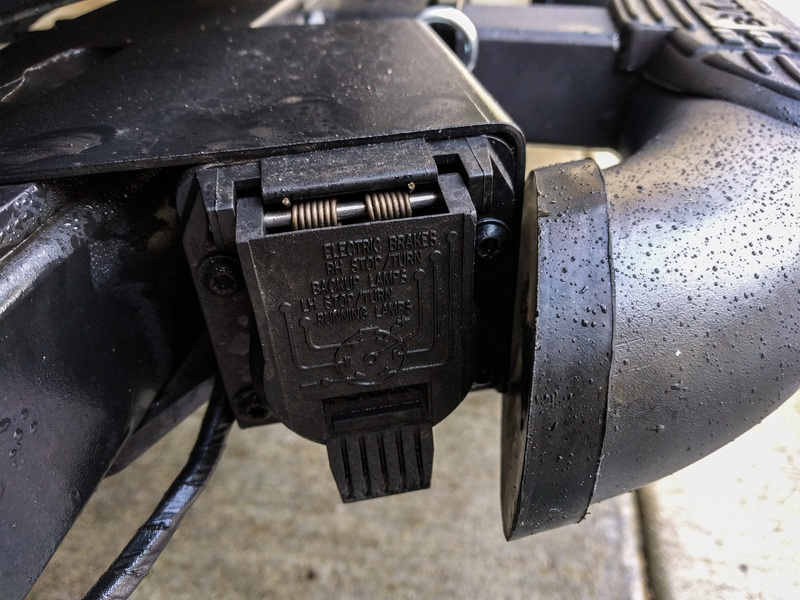 Putting the connector beneath the hitch would mess with exit angle clearance. Putting it further to the side risks stretching the trailer wiring too far. There’s no room above the hitch. There’s not enough depth behind the plastic bumper to flush mount it there, either. This isn’t a design we’ve seen used anywhere else. Why Mercedes chose it when it is so unusual is a bit of a surprise. We’ve given up for the moment. We’re using our cheapo lock. It seems to be holding up OK for the few winter months it’s been on the van so far. But we don’t hold out hope for it longer term. If anyone has found a secure locking hitch pin that works with this setup and doesn’t rust/seize in a couple of months of full time use, please let us know in the comments. I appreciate your problem solving techniques. This has me scratching my head too. Have you thought about drilling the bumper, anywhere that gives you enough slack in the harness? Hey Scott, we thought about drilling through the plastic bumper but there aren’t many places on the back of the vehicle that have sufficient clearance behind the bumper for the socket to install properly. There is enough slack wire in the harness that you could probably make this work *if* there was space inside the bumper. on a related topic, did you try to re-rout the main cable from the rear of the van to the front. i don’t understand why Mercedes left it exposed rather than rout it in the roof cavity? We didn’t re-route the main harness. We chose to run it in conduit and then covered the conduit with our ceiling coving. My guess is that it’s a cost thing for Mercedes. It would take longer to thread it through the roof cavity, and that would cost them money in assembly time. Are you still using this same setup for the locking hitch pin? Working ok? Brian, we’ve still got the same locking hitch pin in place. We’ve unlocked it a couple of times and it’s still working fine. The trick appears to be to keep the internals of the lock completely doused in waterproof grease. Do you put the key hole up or down? I saw some of the 90* ones on Amazon, seems like the clamping ones get the bad rap and that was from 2015 reviews. I wonder if they work better now. But may just go with your setup since I know it works. Key hole is up and then turned around as much as you can. We stuck a piece of black electrical tape over the key hole too. Not sure how much that helped. I don’t think there’s a ton of security with our setup. It wouldn’t take much to break the lock off. But it works for opportunistic theft and the step that we have probably isn’t worth a thief’s time. Next PostNext What things really void your vehicle warranty?